Please follow these steps in the order listed. Turn on mercury arc lamp. The mercury lamp should always be switched on before all other equipment. Wait for the lamp to ignite and the "ready" green LED to light up before continuing. 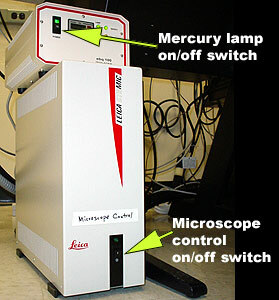 Switch the microscope control power on. 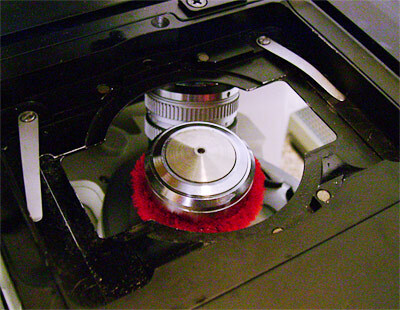 The microscope may be used as a standard microscope without the confocal unit. A. )The Scope is however completely motorized and the power must be on to use it. B.) 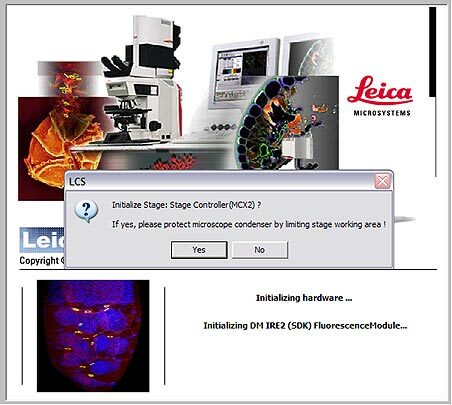 If you are using the confocal, do not put a sample on the microscope until after the confocal software has initialized and is running. Switch on the power for 405 nm laser if needed. Press Red button, when lit turn the key from O to I. Turn this on only if you are using the 405 nm laser line. If you need the laser for red dyes (e.g. Rhodamine, RFP, Texas Red, Cy3), on the power supply box 1.) turn key to right (from O to |) and 2.) 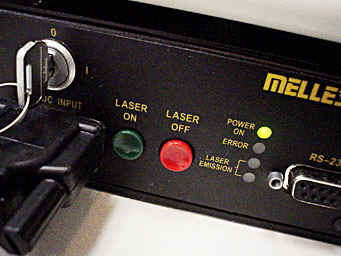 Press green button ("LASER ON"). Turn on the red switches marked "PC,SCANNER, and LASER". Turn the "LEVEL" knob to between "MIN" and the 9:00 position. Turn the key to the "START" position, hold for one second, and let go. Next turn the other two laser keys to the "ON" position. Make sure the computer is on and fully booted up to Windows XP. If the computer is not on, use the red power switch at the far right and wait until Windows XP is ready before proceeding. Move the red scanner power switch to on. Turn the red PC power switch on. Log in to the TCS user account. Answer "NO" to the question about initializing the stage. 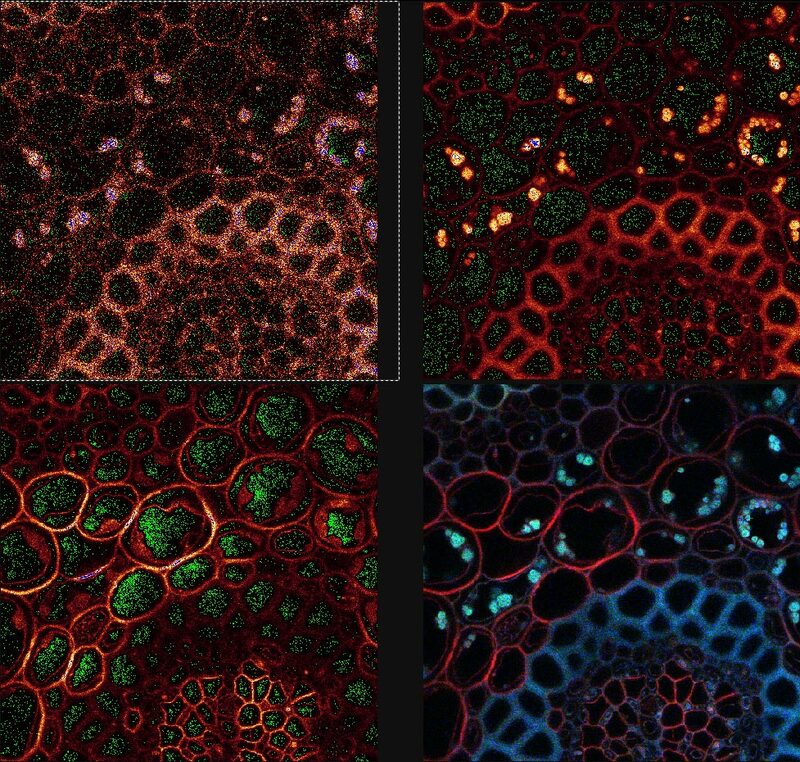 Using the button, choose the preset fluorescence method or set up your own. Set up a sequential scan by creating a master method with the detector bandwidths all set at the same width. After setting the detectors to the same settings proceed to create individual laser methods which should be saved. Use the tab to add laser methods to scan. 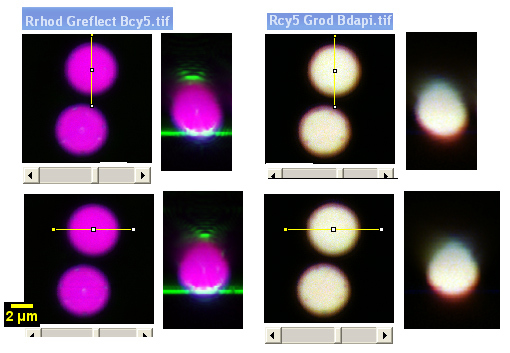 Be sure that methods in the sequential scan window all have the exact same spectral slit settings! Zpos- Z position of specimen, relative to image on monitor -may control galvo or objective (typically galvo). 1. Gain: Initially the image will probably not be present, making it necessary to adjust the gain initially. Most folks will end up setting the gain levels in the 500-900 range out of a possible 1000. 2. 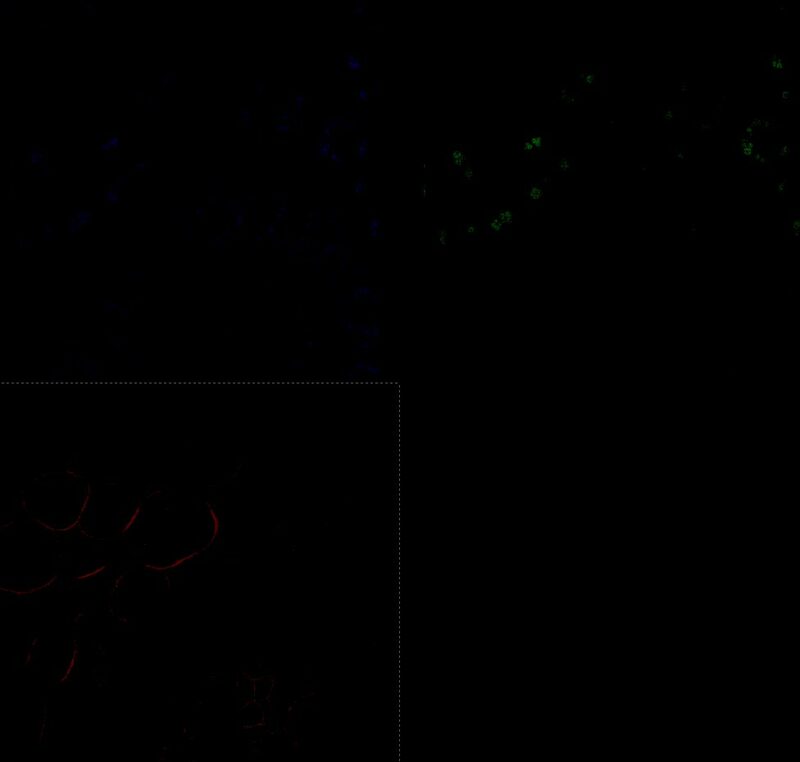 Z-Position: The specimen may simply be out of the confocal plane, adjusting the Zpos knob to move it may make the live preview much brighter. It is important to clearly focus visually on the sample before switching to the scan mode. 4. Offset is the black level of an image and may be viewed by the QLUT as green. The image should not contain any green in areas where there is a signal and the green should be adjusted for most imaging such that it is speckled and not solid. Setting the offset too high will cause the loss of low-intensity signal and should be avoided. 5. Line Average: This should be used to capture all final images with reduced noise. Setting the line average to either 4 or 8 lines seems to be adequate for most use. While it has not been looked at quantitatively we think that the 16 line average doesn't provide much improvement on 8 lines, especially when the time require for aquisition is considered. *Alternately, Frame Averaging may also be used, in doing so the microscope scans the full frame multiple times and averages those full frames. 6. Zoom setting: Zooming in on the image will allow the user to capture an image with much greater detail and seeing the smaller structures in a sample. It is important that one doesn't zoom beyond the optical resolution of the scope. To read more about zoom settings see the optimal zoom settings calculated 12/03. Adjusting the Display and Saving Data. 1. Display: Adjusting this button will allow the user to view the entire image on the display (Auto) or as the image exists (1:1). The setting of 7:1 will display each voxel (Voxel is the term used for a 3 dimensional computer pixel.) 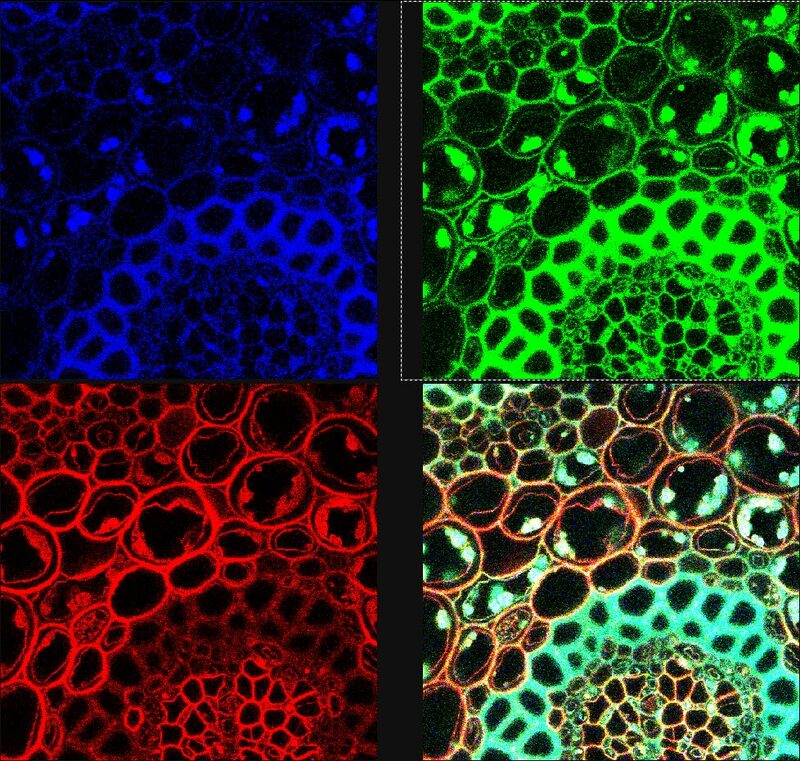 As the confocal takes optical sections the data is collected as voxels not pixels.) as seven pixels on the screen, whereas the setting of 1:7 uses 1 pixel of the display to represent 7 voxels. The display setting directly effects the snapshot. 2. Snapshot: To save the display image as viewed on the screen you may rightclick on one of the channels then: Send to > Experiment > All Snapshot. 3. Saving: Images should be saved immediately after acquisition to avoid loss of data collected over long periods of work. Initially it is neccessary to set the directory and create a name for the files to be saved within an experiment. This name will be used to create a folder within which the images and a text file containing the instrument parameters used during collection. When multiple labeling, you should check for spill over from any shorter wavelength channel into any longer wavelength channel (especially from the green channel into the red channel). 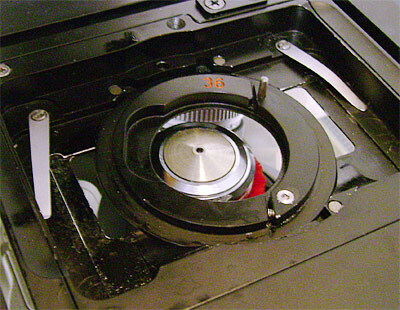 You must use the sequential imaging mode if there is spill over. 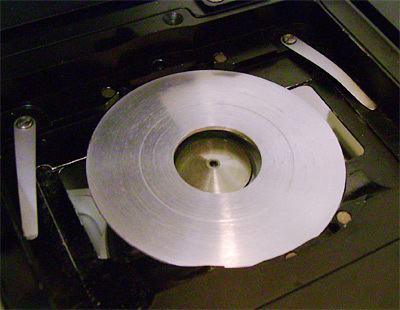 Leica printed this bulletin in November 2002 to describe sequential scanning. Images should be collected via the Single Scan button with line averaging or frame averaging set. Keep in mind that the Format button sets the number of pixels comprising the image and the resolution of the raw data. But the image you see on the screen may be zoomed or shrunk (with loss of resolution) if the Display is set to Auto. THIS IS A CHECKLIST; MAKE SURE EACH STEP IS FOLLOWED! Make sure you quit the software before turning off any hardware. Quit AOBS software. Ar laser dial at MIN position. The gas laser has limited lifetime; we don't want to leave it on high unnecessarily. If laser for red dyes is on, 1.) press red button and 2.) Turn key to left (from | to O). Burn all files to CD or transfer to your computer over ALNET. Check that your files copied or transferred correctly. If disk space gets low, without warning AIF staff may delete any files more than 1 day old. Clean oil off objectives. Use minimal pressure and lens paper only. Log out of computer account. * Computer red switch AFTER Windows shutdown is completed. Clean up all your stuff (slides, crumpled Kimwipes, etc.) Gloves, dishes, etc. must be removed and thrown in the red barrel in your own lab! Optimal scanning magnifications have been calculated by based on thegr literature from Leica and the formulae in Jim Pawley's Handbook of Confocal Microscopy. Click here for the Excel spreadsheet. If you can't get any laser through the system, make sure the illumination pillar is in its upright position. When it is tilted back, the laser illumination path is shut. Keep the laser turned low! We don't want to burn it out. 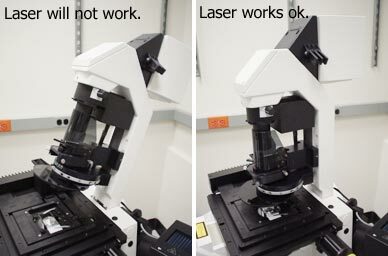 For normal imaging with 458 to 514 nm light the laser should be kept between MIN and the noon position. If you turn the laser to MAX for bleaching or uncaging, make sure you return it to a low power position as soon as you are done. Please be sure to place the immersion oil in the petri dish top or weighboat. Please never put the oil down on a table, mousepad, etc. This really simple step will keep everyone who uses the microscope happy and your clothes from getting oil on them. If you are experiencing problems with horizontal lines while using the weaker (especially 458nm, 476nm) laser lines? Try to clean up noise using fft post-processing. 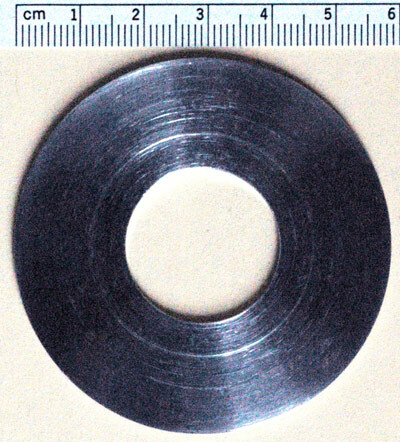 Standard small culture dish insert. 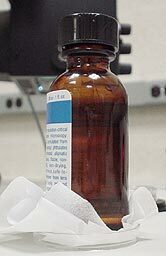 4um Molecular Probes Tetraspeck beads look skewed to one side due to a problem with the optics. Also, if doing critical; colocalization, watch out in the Z axis for chromatic aberrations. 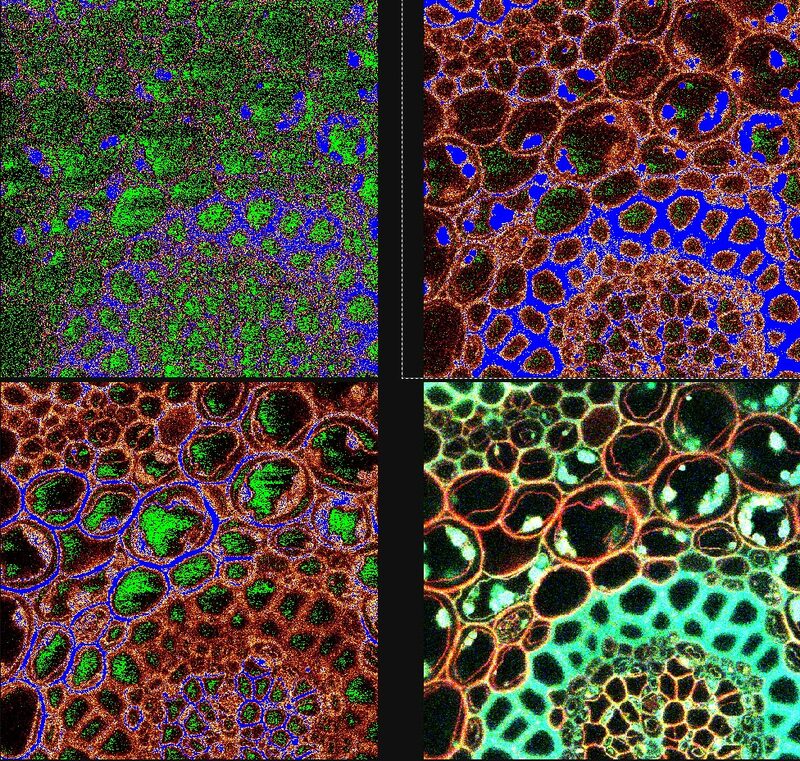 Examples of images from this microscope here. If you have problems using these instructions or would like more information on confocal at the AIF please contact Michael at cammer@aecom.yu.edu.